Since Moorestown’s founding, a broad range of commercial creativity has strengthened the township and helped forge its unique personality. 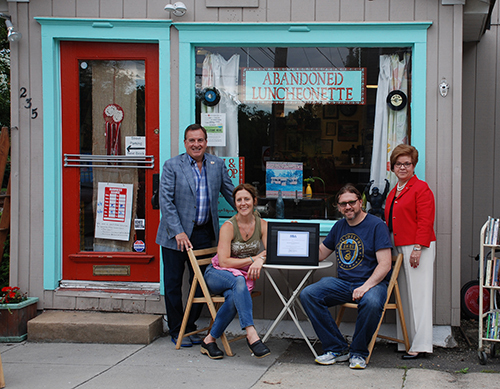 One of the newest ventures in our distinctive community is Abandoned Luncheonette, an authentic and charming café, music outlet, and vintage shop that adds an extra dimension to what Moorestown has to offer. Moorestown Business Association is delighted to recognize owners Dave Khanlian and Jen Hilinski and their unique and genuine enterprise for their contribution to the vitality of the township. Owning a business wasn’t really on the Moorestown couple’s radar since both are education professionals with meaningful careers—Dave just celebrated his twentieth year as a fourth grade teacher at Kirby’s Mill School in Medford, and Jen is a student assistance counselor for the Maple Shade and Lindenwold school districts. But the “for sale” sign on the empty café at Third and Mill Streets caught their eye, and they began to explore the idea of buying it and turning it into a neighborhood spot where Dave could broaden his avocation for selling and trading interesting and rare music albums and CDs and other vintage items. Further investigation into the property revealed that, due to its zoning status, it had to remain a food outlet if used commercially. What might have been a drawback instead inspired Jen to add her excellent cooking skills to the project. The price was right and they decided to purchase the building in July, 2016. “We took it upon ourselves to create the kind of place we wanted to see in our town,” explains Dave, who grew up in Moorestown and also organizes and hosts house concerts with the same goal. Dave and Jen decided to call their venture Abandoned Luncheonette for what might seem like an obvious reason, but music lovers will remember that is also the name of the second album by Hall and Oates, which happens to be the first group Dave ever saw in concert. Dave set about curating the items for sale at the store while Jen took the necessary commercial food courses to open a public restaurant. After almost a year, they have honed a niche business that draws a loyal local crowd as well as people from other towns who are looking for vegetarian fare, to add to or sell their music collections, or to browse the eclectic repurposed and vintage items Dave has assembled. Visitors are treated to a countertop piled with amazing baked goods, such as salted tahini chocolate chip cookies and vegan figgy shortbreads, and a chalkboard menu that features enticing daily specials. Depending on the time of day and season, the kitchen offers a variety of items that include “Prana Bowls” filled with items like raw or roasted veggies, brown rice, greens, and chick peas; avocado or tahini toast; sweet potato stout chili; soups, including carrot ginger and chilled asparagus; salads with homemade lemon-tahini dressing; and warm oats with sumptuous toppings. Jen’s outstanding homemade granola is always available, and customers who love the Philly Fair Trade coffee or East Indies Tea (from Lebanon, PA) served at the café can also buy it by the pound to take home. Jen bakes with heritage, non-GMO flour from Castle Valley Mill in Doylestown and is committed to sourcing local and organic ingredients whenever possible. There are several tables and counter seating where folks can relax and enjoy their food, but takeout is also popular. On Thursday evenings, Jen puts together a to-go package for two that consists of a soup, salad, and treats for $24. The couple set out to emphasize the green component throughout this venture, and all takeout containers are recyclable materials. Metal straws are used for beverages served in the café and are also for sale. In addition to their education careers, Jen and Dave are busy raising sons Stanley and Bruce and volunteering in town—all of which limits the hours Abandoned Luncheonette can be open. But the couple’s commercial venture in Moorestown offers them an outlet to be autonomous and creative, and the enticing challenge of an ongoing project. “Having a place in our neighborhood where we want to be and that is welcoming for people to come was important to us. We are committed to great food and music, and to our community.” During the school year, Abandoned Luncheonette is open on Thursday evenings from 5-8 and Saturdays from 9-3. This July, the hours will expand on Thursdays to 11-8 and Fridays will be added from 11-2. Menus for the day are posted on Facebook and Instagram (and the front door), and those interested can also be added to an email list by contacting abandonedmoorestown@gmail.com. Don’t miss this township treasure!